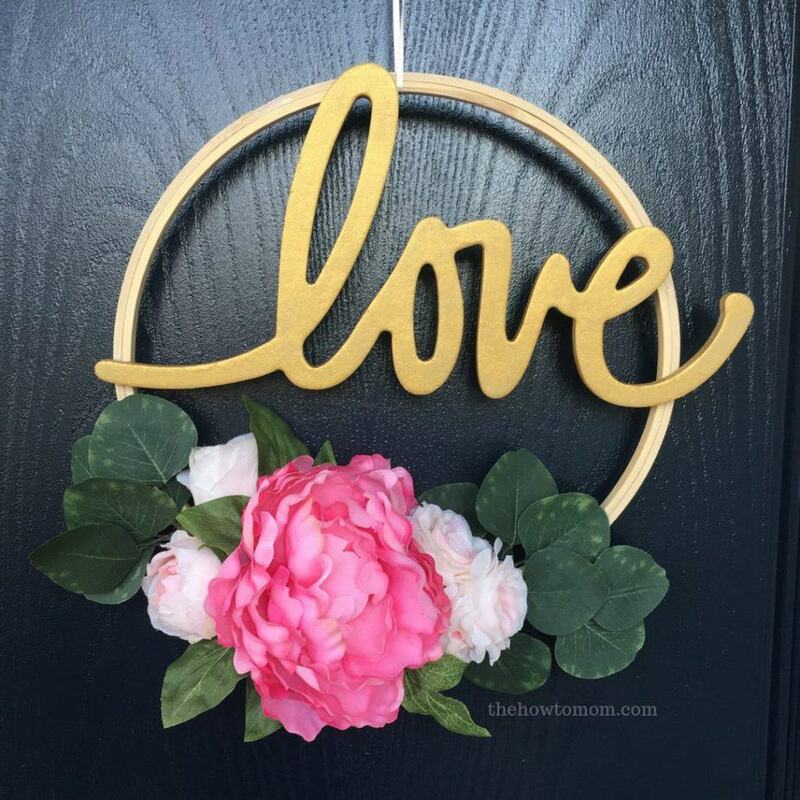 How to Make a Valentines Hoop Wreath – Modern and Beautiful! 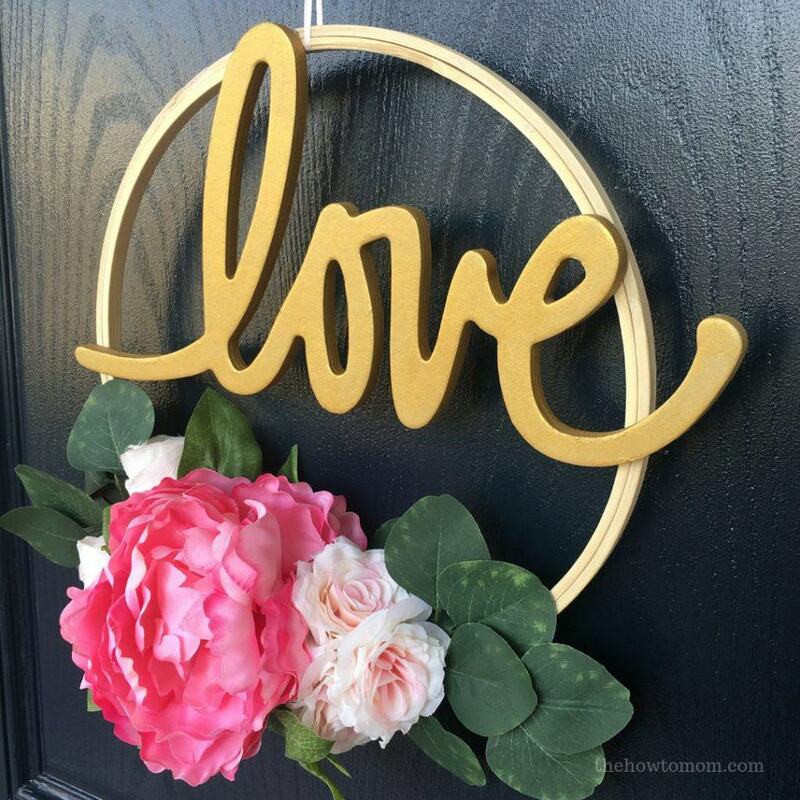 This modern, asymmetrical Valentines Day wreath is made with an embroidery hoop, handwritten “love” cutout and gorgeous on-trend peonies, roses and eucalyptus. 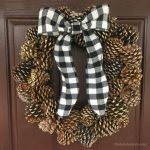 I’m venturing out of my comfort zone with a whole new style of wreath! 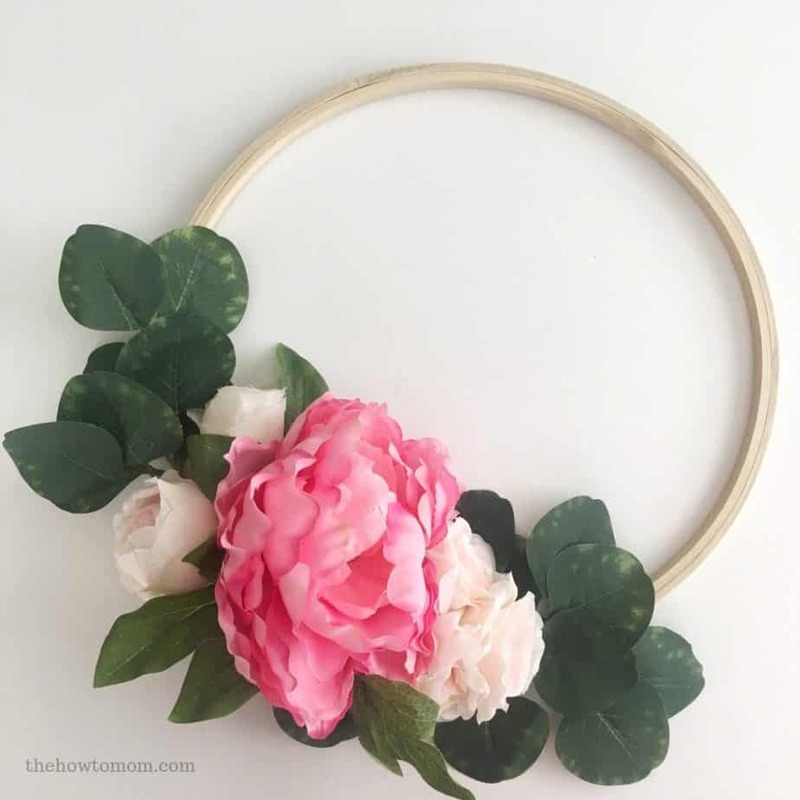 Hoop wreaths have become popular on Pinterest in the last little while, and I’ve been wanting to try to make one. 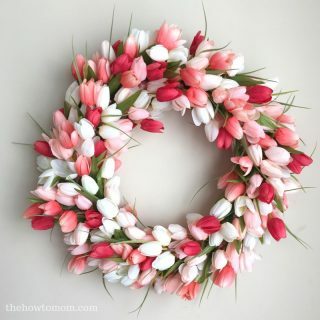 They seem to defy gravity, and I’ve wondered how the flowers stay put on such a skinny hoop. 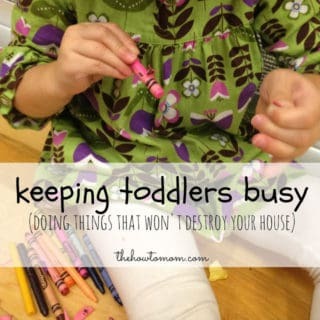 But they’re not tricky at all! This post contains affiliate links for your convenience. 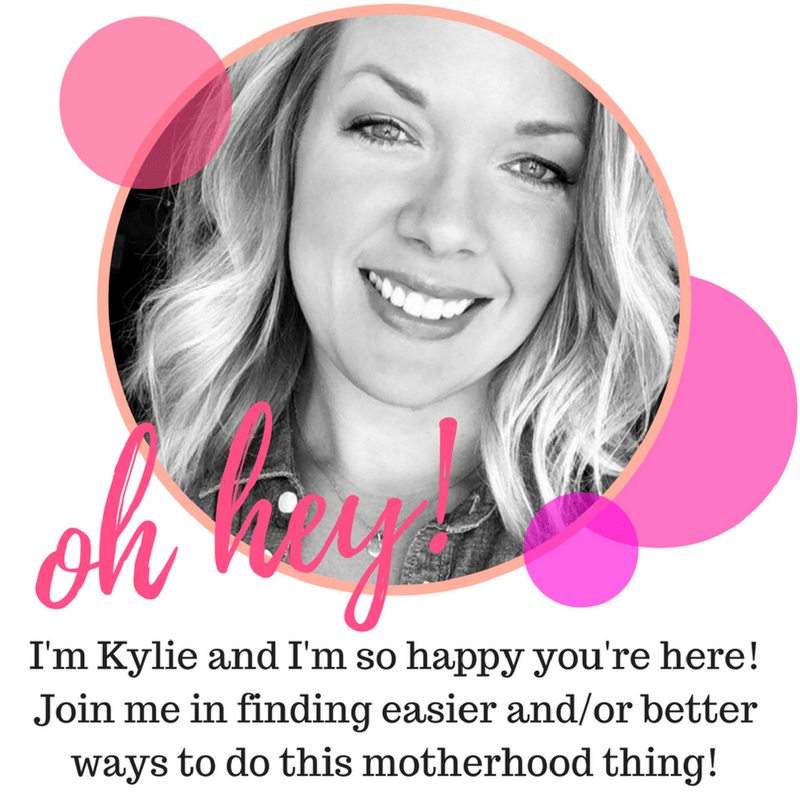 I may receive a commission if you choose to shop through my links. 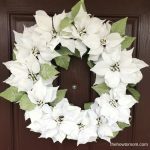 The secret to making this wreath so easy is the floral picks! 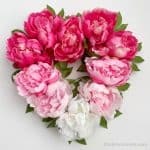 Floral picks are flowers with short stems that are already arranged and bound together, perfect for wreaths, boutonnieres and other craft projects. 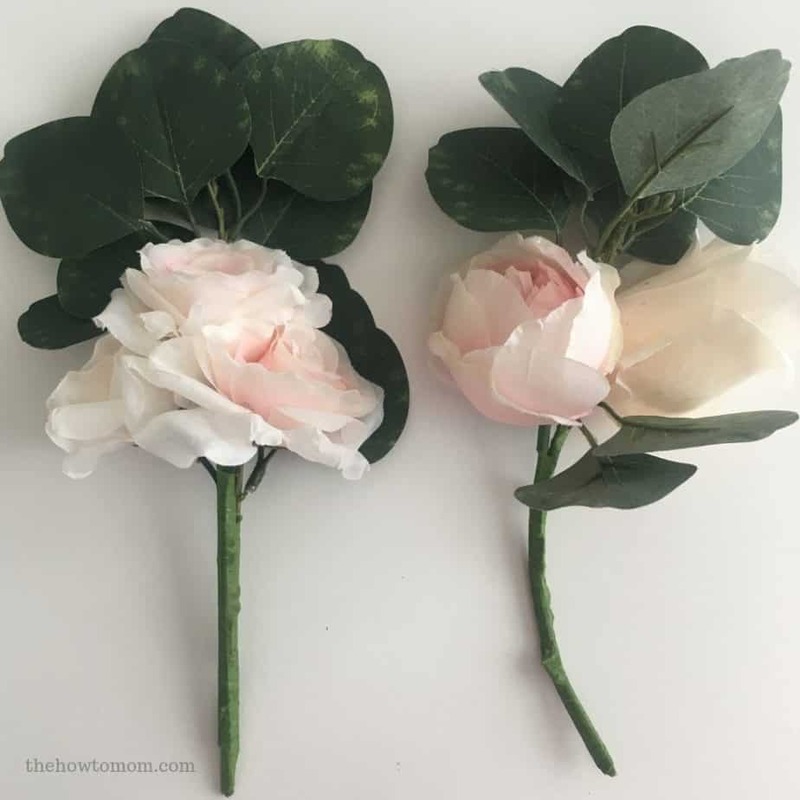 I chose some with roses and eucalyptus greenery from Joann Fabrics. They were in the seasonal floral section and were $2.99 each, and I can’t find them online. Boo. The hardest part was actually finding the right handwritten “love” cutout. I hit all my favorite craft stores, and finally found one I liked at Hobby Lobby, way in the back with the other unfinished wood pieces. 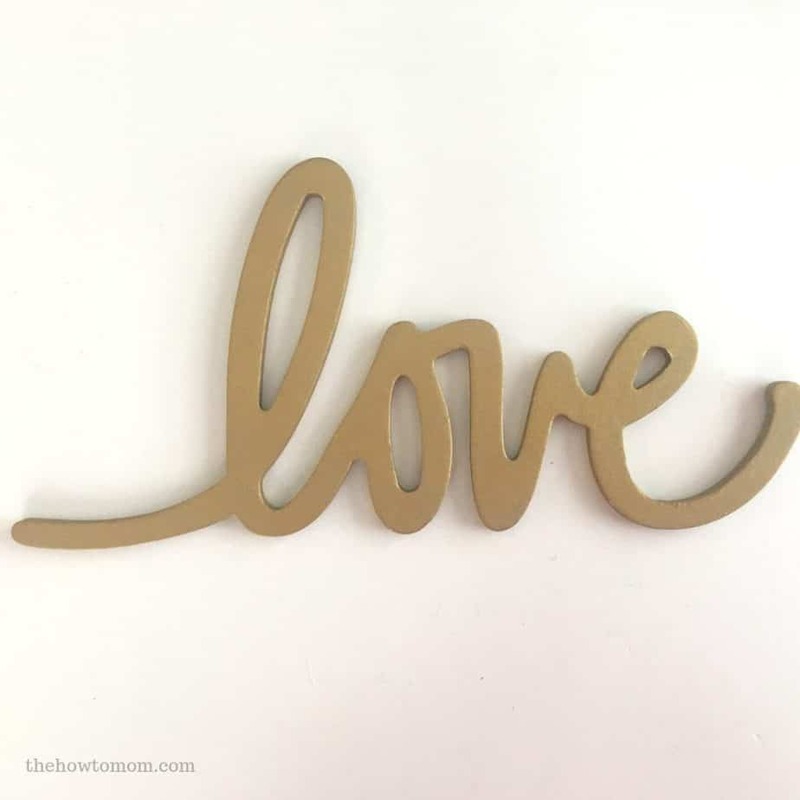 Here’s the link to the handwritten “love” cutout I used. 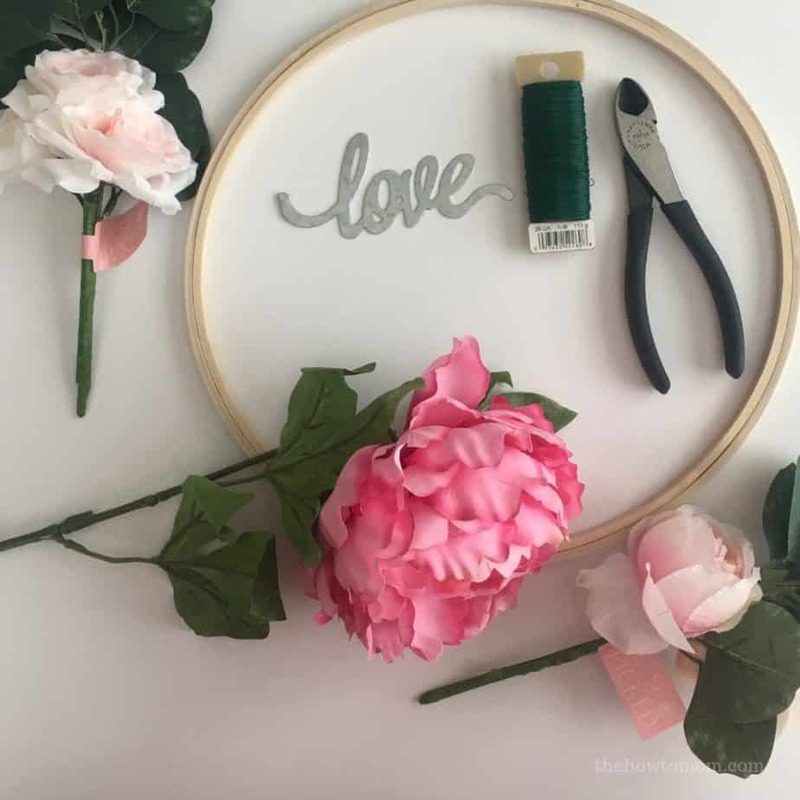 I also think that their “hello” and “welcome” would look lovely, in fact there’s a pretty good chance I’ll be making some more hoop wreaths with other sayings! My “love” is chipboard, which is basically cardboard, so it may not do so well outside with wet weather. So this beauty is now hanging in my front room where I can admire it more anyway! If you find a wood “love” you could absolutely hang it on your front door though. 2. Bend the neck of any flowers so that they stand up straight, if you’re going to wire them on. Cut the stem completely off if you’re going to use hot glue. 3. 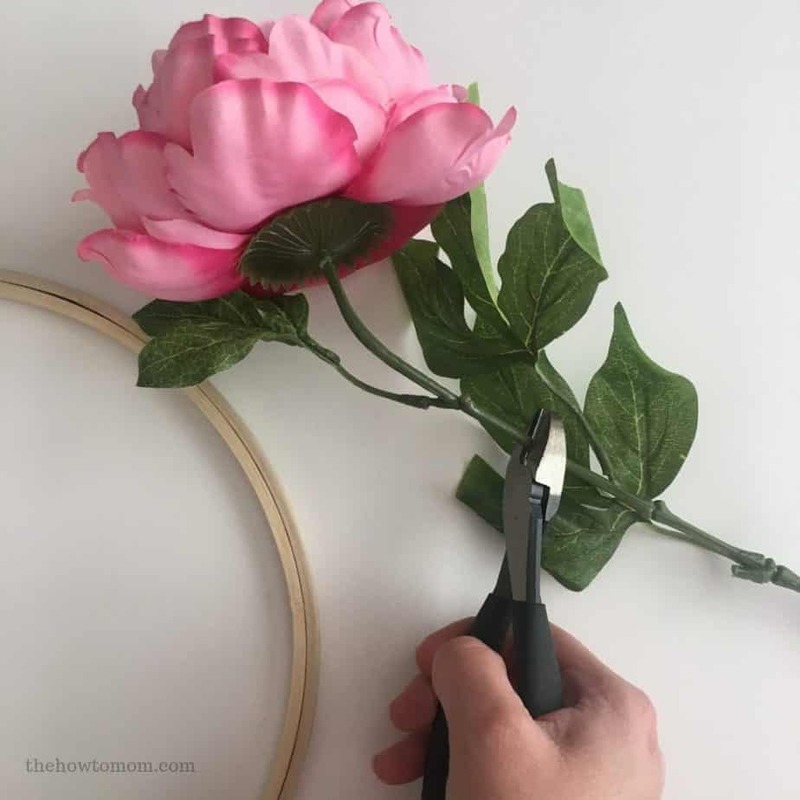 Lay the floral pic and flower on the hoop, and wrap the wire around them to secure. 4. 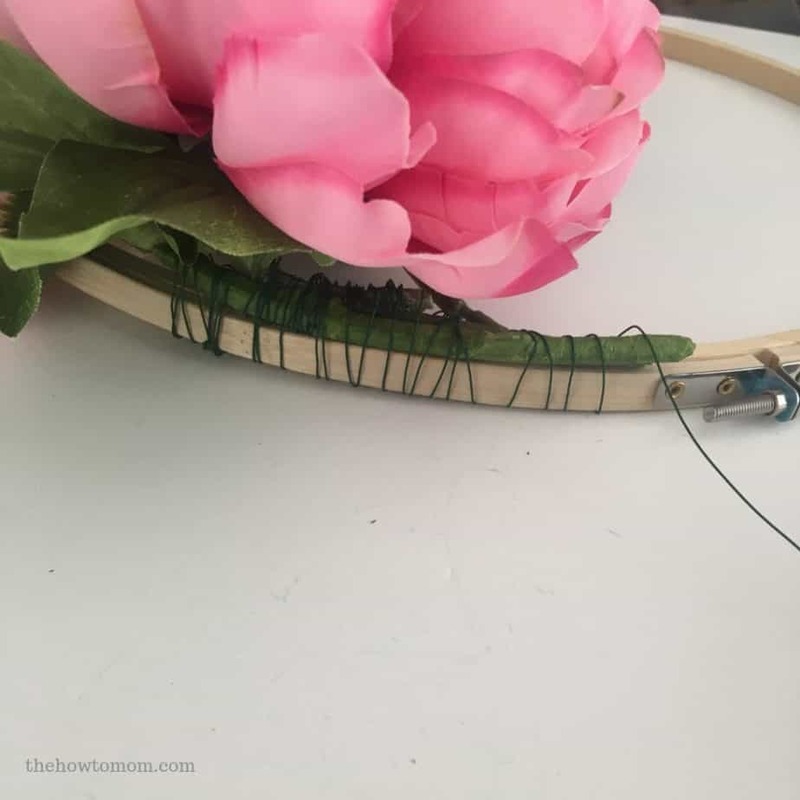 Repeat for the other side, wiring the stems onto the hoop tightly. 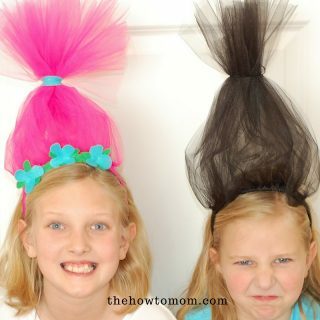 You can use hot glue to easily position the greenery. 5. 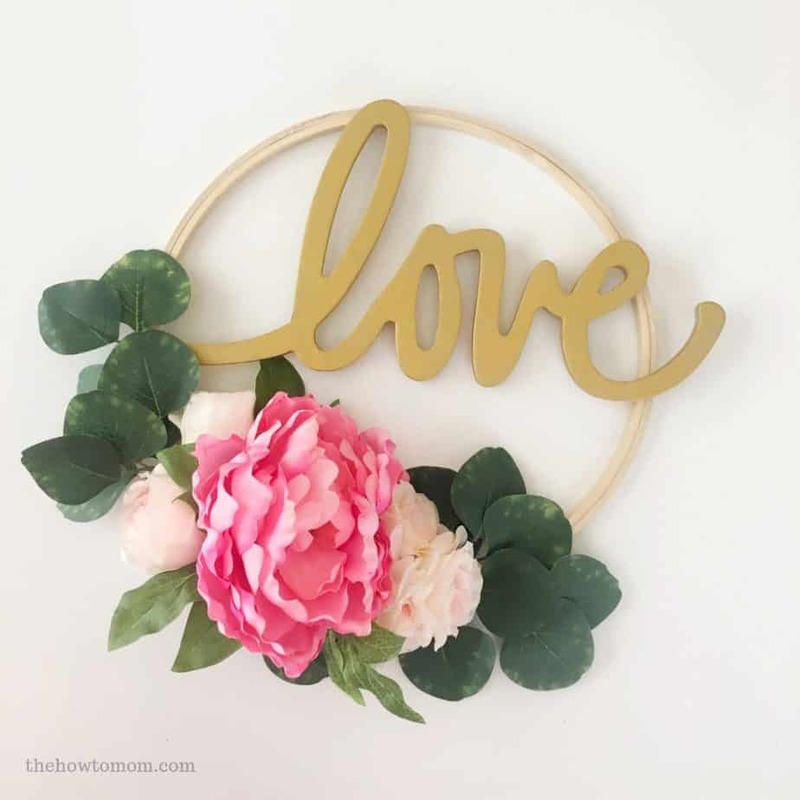 Paint “love” cutout your desired color. 6. 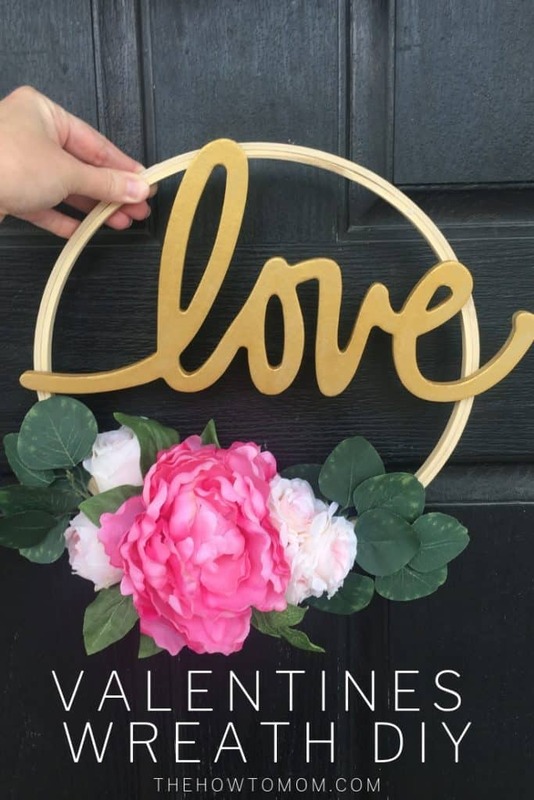 Hot glue “love” cutout to hoop. I like it a little off center and asymmetrical. 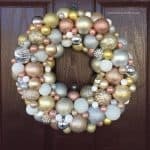 I love to see your wreaths, tag me on IG @thehowtomom or #thehowtomomwreaths so I can tell you what an amazing job you did! 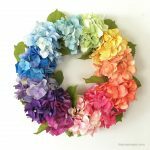 For more floral wreath DIYS, check out my Spring Tulip Wreath DIY or How to Make a Rainbow Hydrangea Wreath. 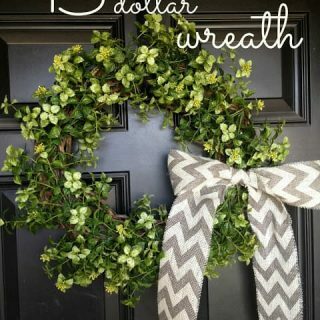 If modern greenery is more your style, maybe you’d like my 15 Minute Garland Wreath or my Faux Boxwood Wreath DIY. 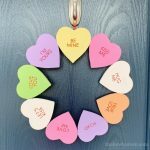 Conversation Heart Wreath DIY – Cute and Easy!